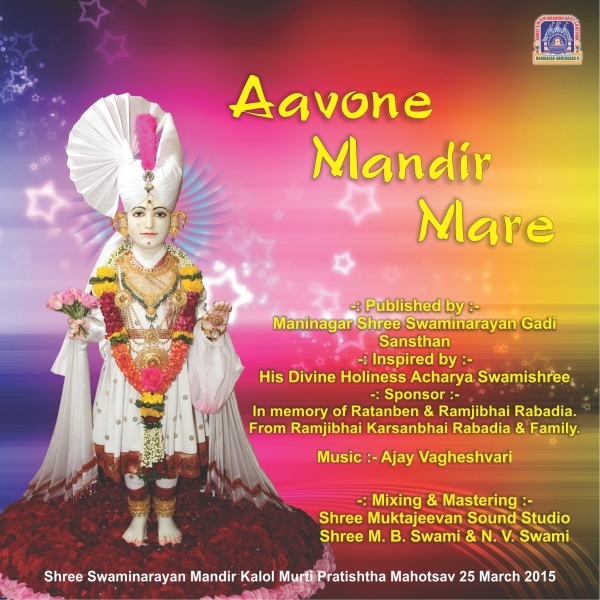 The CD of devotional music, 'Aavone Mandir Mare' is a collection of prayers imploring the Lord to come and preside in our Mandir - this not only refers to the grand temples built in the towns and villages, but also the Mandir that forms our own minds. For the Lord to preside within us, we need to be pure and obedient to His commandments. The CD was released during the grand opening festival of Sarvopari Shree Swaminarayan Mandir Kalol by Acharya Swamishree Maharaj on 23 March 2015.